← Proof: Pesticides Are MORE Toxic Than Declared! 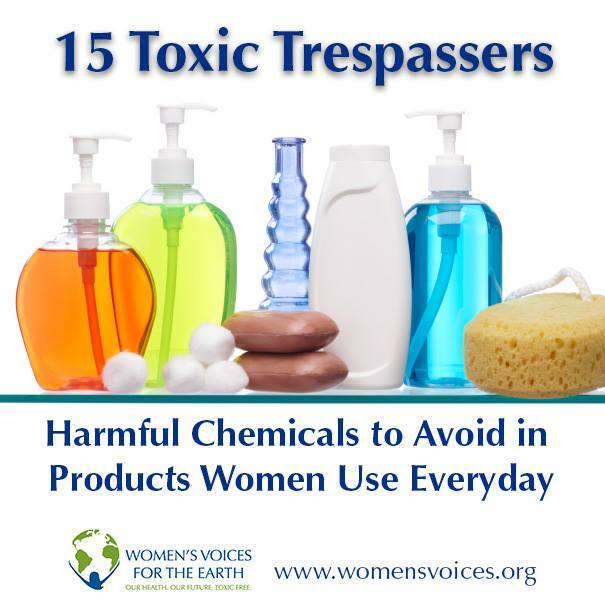 Women’s Voices for the Earth has a great page about toxic ingredients commonly found in products women, men and children are exposed to on a regular basis, usually everyday, even when we try not to be. Check it out, get informed, and take action to protect you, your family and the planet that supports our lives. Sadly, our current regulatory systems do more to protect those who are polluting us, than to protect our health. I don’t know how we are going to change this without a massive outcry, but we CAN stop buying the products we learn are harmful to us and to future generations. The Skin Deep website has information about thousands of personal care products and ingredients, WVE has recipes to make your own, and then some, and Mind the Store is successfully calling on retailers to stop selling toxic products. We have more power than we know, but only when we use it! This entry was posted in Action, Chemicals, Environmental Health, Pollution, Products, Toxic Trespass and tagged fragrance chemicals, hazardous air pollutants, toxic chemicals, toxic ingredients. Bookmark the permalink. Skin Deep is so wonderful. There is also another site I like for chemicals in beauty products, but after changing my passwords, I am having a hard time getting into my blog and email folders and finding anything, which is making me crazy. I make a lot of my own hair products and skin products because of my allergic contact dermatitis. I will eventually post recipes if I can ever get back into my own blog on my own computer. WP is letting me log in on J’s computer. There are also tons of DIY skincare/haircare recipes on Pinterest and YouTube. You could make one per day and not have enough time in your life to make them all. Hope you can sort out the password nightmares quickly. The safe alternatives are so simple really, and can be played with at whim almost.